Following-up on their meeting on 13 July 2017, several associations and trade unions of gendarmerie personnel from three European countries met on 25 January 2018 in Amsterdam. On the invitation of the Dutch MARVER (Marechaussee Military Union), representatives of the Spanish AUGC (Asociación Unificada de Guardias Civiles), the Portuguese APG (Associação dos Profissionais da Guarda) as well as EUROMIL President Emmanuel Jacob came together. The Chairman of MARVER, Sven Schuitema, welcomed the participants in Amsterdam, briefly recalled the discussion at the first meeting in July 2017 and expressed his wish to stay in contact. President Jacob thanked MARVER and the other associations for their initiative to organise these kinds of meetings. He opened the debate with a presentation of the history, the goals and the functioning of EUROMIL. He also highlighted the particular situation of military associations and trade unions in Europe. Some of the upcoming key moments such as the outcome of a case at the Italian Constitutional Court which is expected in April 2018 and the result of the EUROMIL complaint against Ireland at the Social Charter Committee were discussed. The participants discussed the possible way ahead and a strategy for more and better cooperation between associations and umbrella associations representing military personnel as well as police personnel with a military status and non-military police people. A first challenge is without any doubt the right of association which is linked to a well organised social dialogue. 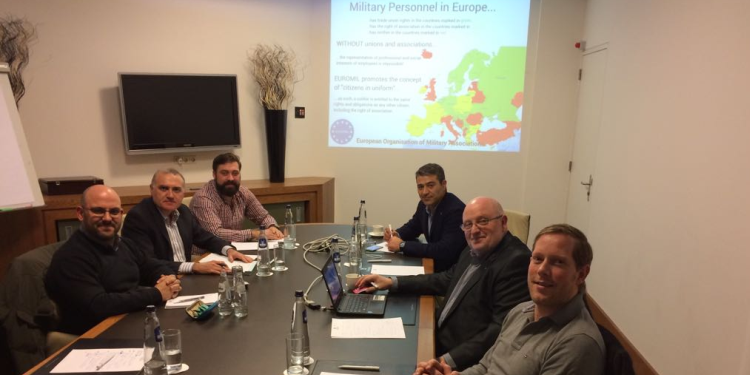 In this framework participants agreed to continue efforts to create a platform to defend these specific security workers on the European and national level. Participants agreed that it is more important to work on the issues which military and police personnel have in common than to highlight the differences.